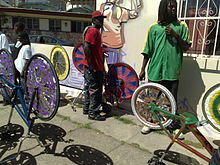 A scraper bike is a bicycle that has been modified by its owner, often with decorated spokes with matching body and wheel colors, using tinfoil, re-used cardboard, candy wrappers and paint. The bike frames themselves are also modified with BMX frames, heightened seats, or custom pieces to create unique bicycles. Scraper Bikes are an offshoot of the 90's era scraper culture of car modification. “A scraper bike is a piece of art, every artist builds up their bike from scratch using different material, different colors to customize it to fit the artist inside.” - Baybe Champ, 2016. Scraper bikes gained notoriety in 2007 due to the YouTube music video "Scraper Bikes" by Trunk Boiz. The Original Scraper Bike Team was founded by Tyrone “Baybe Champ” Stevenson Jr., aka Scraper Bike King, in 2006 in Oakland, California. Stevenson views the scraper bike movement as a way for local youth to stay active and avoid getting caught up in crime or violence. He wants scraper bikes to be a positive alternative to the struggles which defined his troubled upbringing. "Scraper bikes is a hobby, and as long as you take your time out of your day to make that bike, that you put the correct material on the spokes, and you spray paint your bike a beautiful color . . . or put something that means something to you, you know, in a decorative way on your bicycle, now, that makes you a scraper bike." In 2016, with support from Oakland Public Library and Bike East Bay, the Original Scraper Bike Team opened up the Bike Shed in East Oakland. The Bike Shed, which is a youth-led, no-fee bike shop, is run by “Chef Boy RB” Burnette Jr., aka Scraper Bike President. Members of the Original Scraper Bike Team were featured in Boots Riley’s 2018 film Sorry to Bother You as background extras. ^ cl_admin (2015-02-27). "Oakland's Answer to Hipster Fixies: Scraper Bikes". Colorlines. Retrieved 2017-01-24. ^ Wiener, Jocelyn (2008-12-08). "Teens in Oakland, Calif., find an outlet in 'scraper bikes'". The Christian Science Monitor. Retrieved 13 June 2012. ^ "Video: Meet the Scraper Bike Team of East Oakland". KQED Arts. Retrieved 2017-01-24. ^ a b c "Grand Opening of The Shed: The Original Scraper Bike Team on the Move - Oakland Voices". Oakland Voices. 2016-07-11. Retrieved 2017-01-24. ^ "Maker Faire: Original Scraper Bikes". ^ "California is a place". Retrieved 2019-03-29. ^ "In 'Sorry To Bother You,' an Alternate-Universe Oakland Rings True". KQED. 2018-07-05. Retrieved 2019-03-28. ^ Handy, Alex. "When Police Take Kids' Bikes". East Bay Express. Retrieved 2019-03-28. ^ "Lyft donates $700,000 to bring bikes, free rides to East Oakland residents". The Mercury News. 2019-02-12. Retrieved 2019-03-28. Wikimedia Commons has media related to Scraper bikes.